The first footage of Childish Gambino and Rihanna’s upcoming film project will leave you with a lot of questions. Is it definitively named Guava Island? Why has Donald Glover retired from performing as Childish Gambino, but acting under his stage moniker in his new film project? Was the fan who captured the trailer when it premiered at Glover’s PHAROS Festival in New Zealand this weekend filming it from the moon? 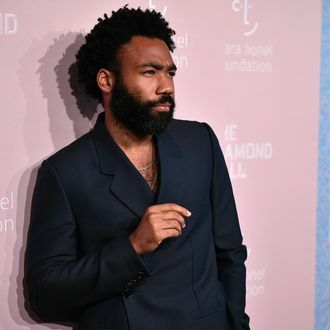 For now, at least we know Guava Island (as the movie is reportedly called) co-stars Letitia Wright and Nonso Anozie, and was directed by Hiro Murai, who also helmed Atlanta and Childish Gambino’s “This Is America” video. As for the movie’s subject matter, Glover’s character laments, “We live in paradise but none of us actually have the time or the means to live here,” a pretty perfect thesis statement. Rihanna will reportedly play his beloved and partner-in-crime in the film, purportedly shot in Cuba, which seems like enough to get you excited to watch the teeny tiny trailer below.